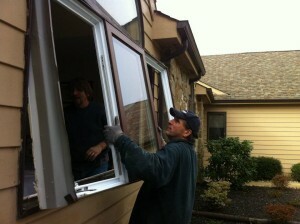 First State Contractors offers replacement windows for Wilmington, DE, and the surrounding community. Our main line is the Simonton™ 5500 Series. Our Simonton™ 5500 Series Windows are well-known for their quality, and their unique and intricate detail. If you select Simonton Windows, you will have many choices, including sizes, exterior colors, and beautiful hardware finishes. These options allow you to create the look you want. Simonton™ windows come with a Lifetime Warranty. If you want energy-saving replacement windows for your home, we offer high-quality, energy-saving windows that may help you save as much as 20 percent on your energy bill each month. We also offer wood windows from Trimline to complement the architectural character of older homes. Every product offered by our company is configured to enhance your home’s overall beauty, as well as its energy efficiency. No matter which type of window you choose, you can be certain that one of our well-trained technicians will do a wonderful job installing your windows. You will get a lifetime labor guarantee, as well as a lifetime manufacturer’s warranty. Contact us today or a free quote and additional information about our replacement windows.